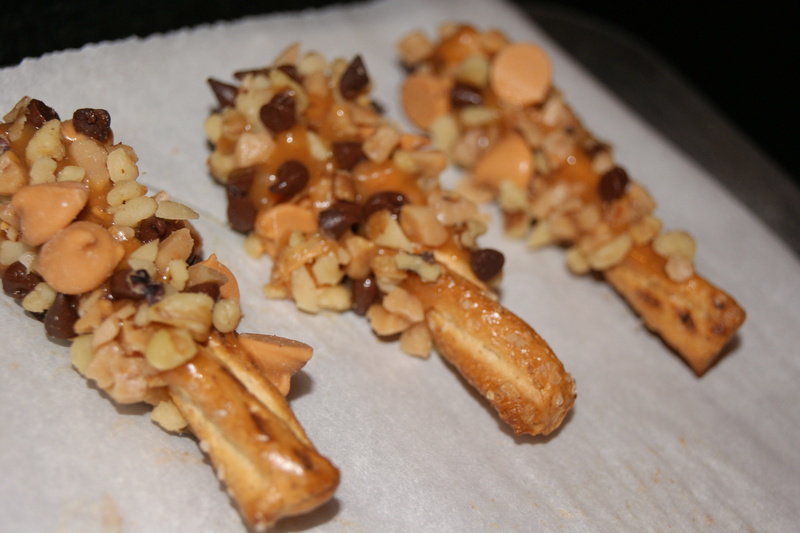 These pretzel stix are full of fun flavors! Savory and sweet. 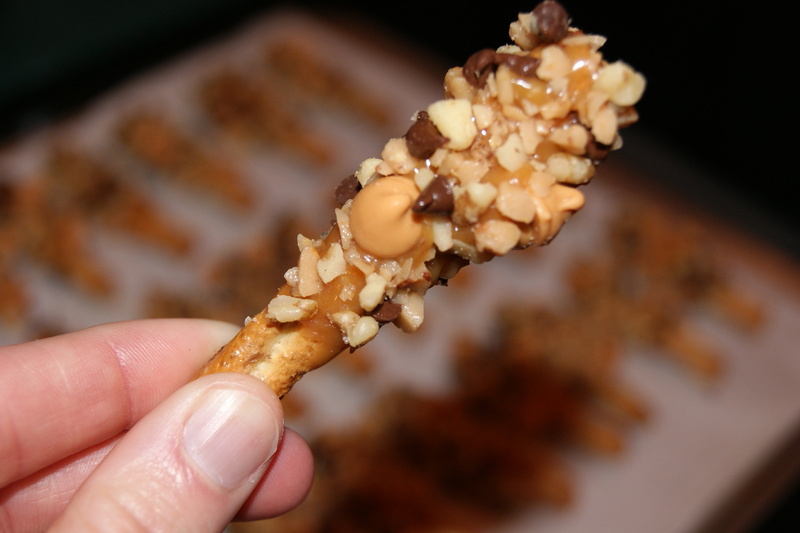 Butterscotch, walnuts, toffee bits and mini semi sweet chocolate chips cling themselves to the ooey gooey caramel that the pretzel is dunked in. Fun huh?! Unwrap all caramels. 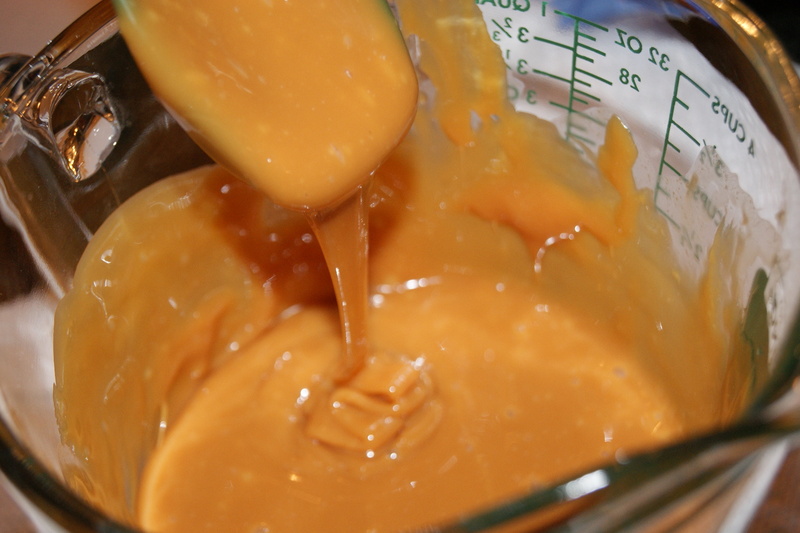 In microwave safe bowl, melt caramels. 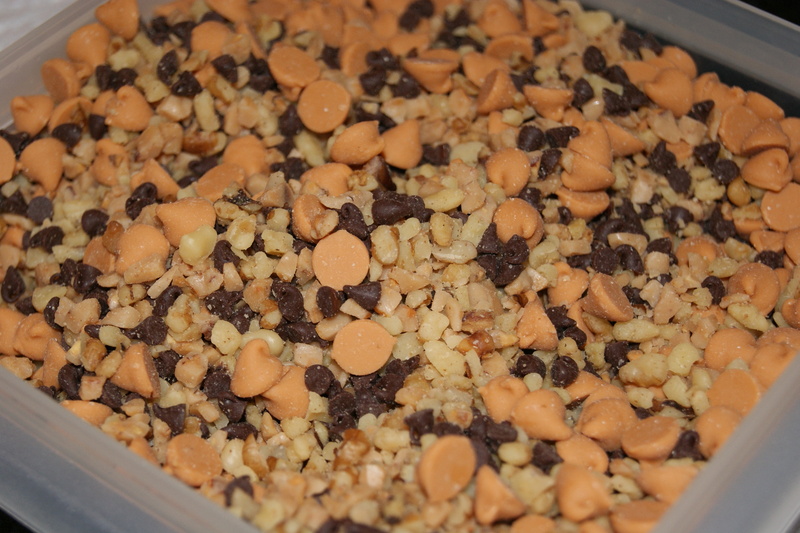 In shallow dish, mix the chips, toffee bits and walnuts. 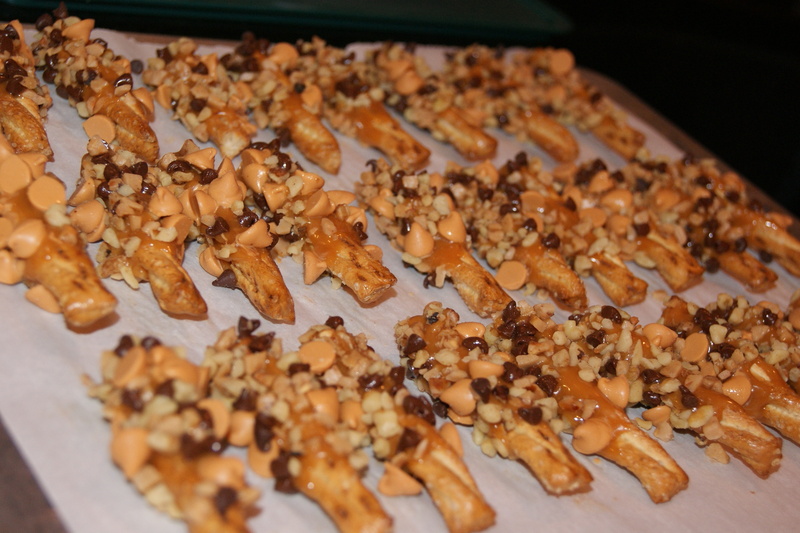 Dip 2/3 of the pretzel in caramel, allow excess to drip off, then roll pretzels in the chip mixture. Place on waxed paper until set. Store in airtight container. Yield about 4 dozen. They look like chicken drummies, ha! Show up with these at the next party you go to and you may get all the compliements of a job well done. But take along the recipe too because once people start raving about them, you’ll want to share the recipe! Pick up. Bite. Chew. Savor the flavor. 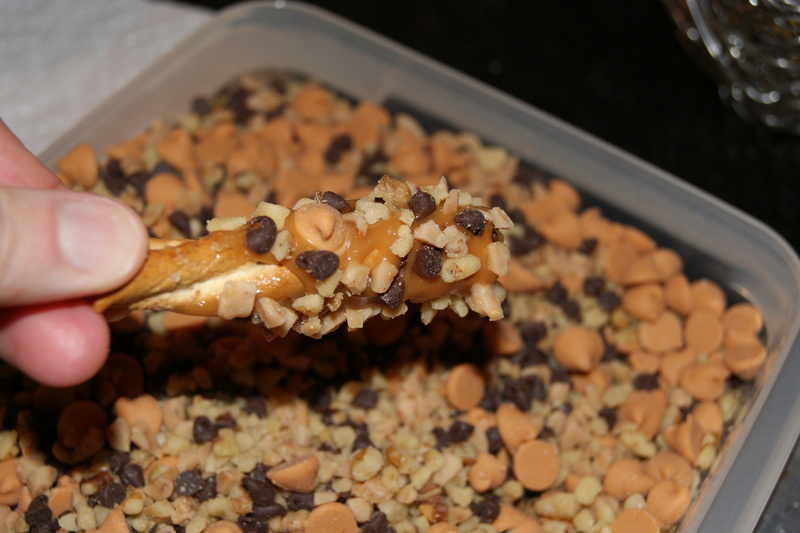 This entry was posted in Deliciousness and tagged butterscotch, Caramel, Chocolate chip, Cooking, Food, Pretzel, pretzel stix, Toffee, walnut, Wax paper. Bookmark the permalink. Those look great! I love how cute they are! Oh baby do those look DELICIOUS! I really want to try this recipe now-it sounds super easy 🙂 Thanks! 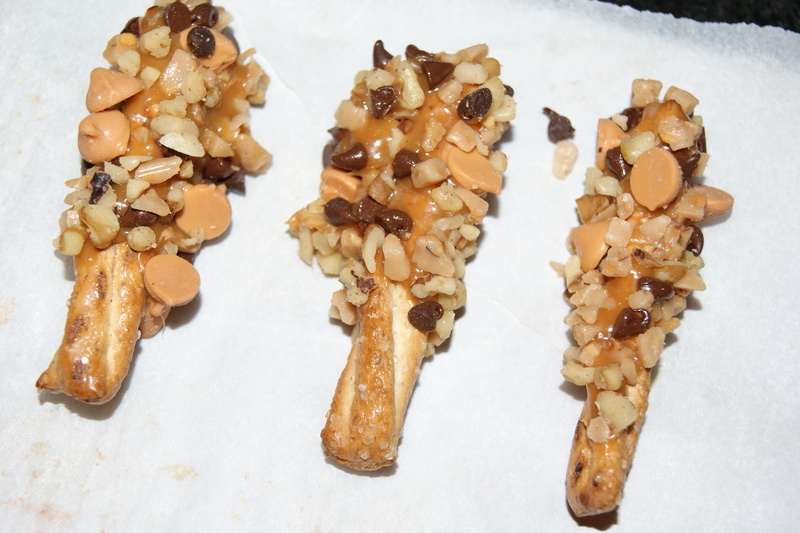 Very easy, especially with melting the caramels in the microwave! Those look awesome! Definitely a perfect thing to bring to a party. 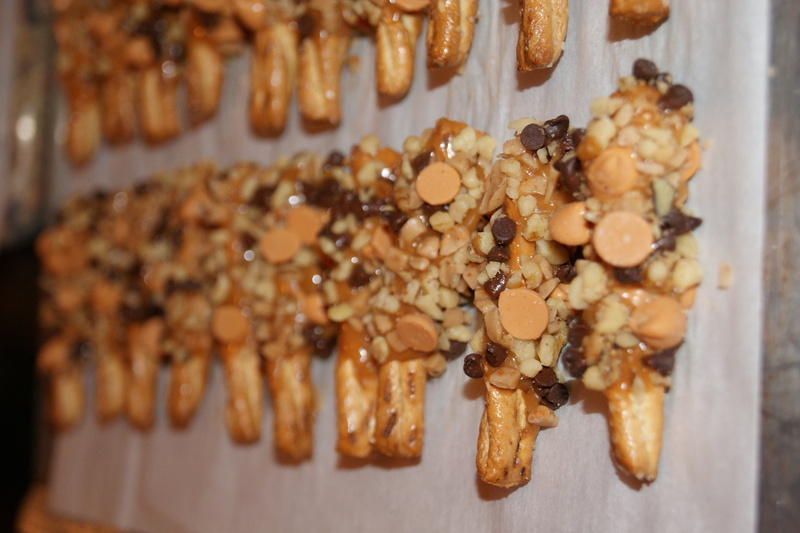 They are so chewy and yummy! You could bag them up too and give as gifts to your friends and neighbors! Holy moly. These would impress my mom so much. 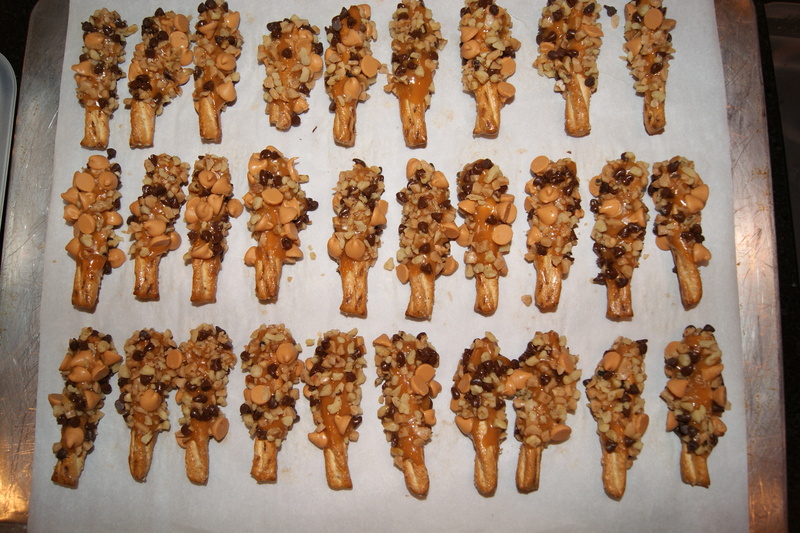 Whenever I try and bake something she always has something wise to say-but you cannot go wrong with pretzel rods. YUMM. Hollie, they are easy to make! Good luck, you can do it! A great gift idea Holly! Enjoy! A great idea Mary! 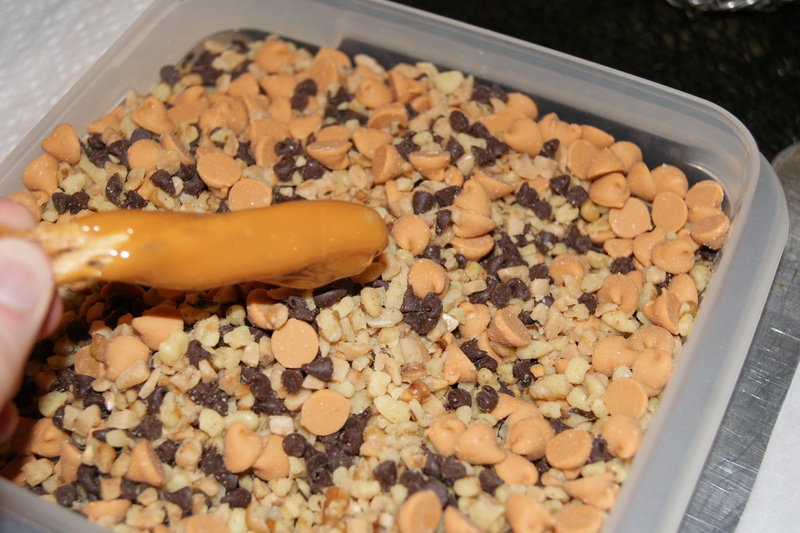 I think I may try a peanut butter and chocolate mixture sometime too! These look so good! 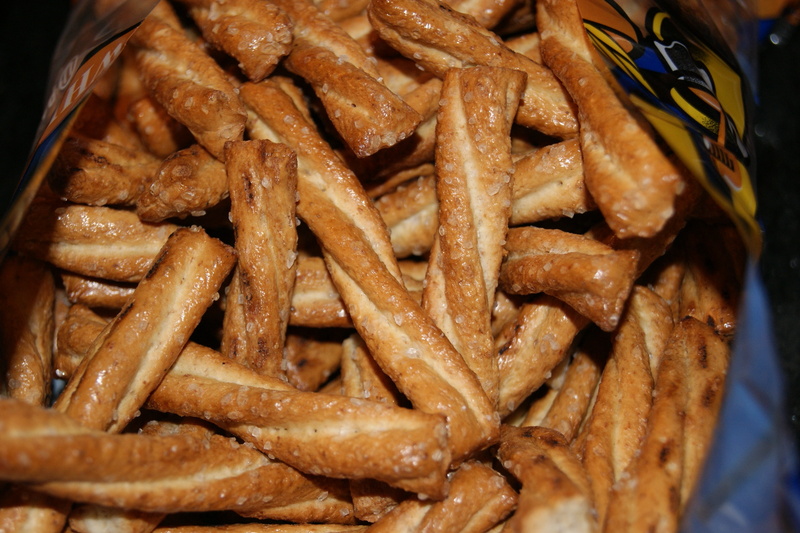 I agree with Erica, the honey wheat pretzels really make the difference! Thank you Mandi! I hope you get to make them too! gotta love cute food that tastes good, too!!!! will definitely be making these over the holidays! Great, I know your family will love them! Those are the cutest little things ever.